I have traveled the world sampling the finest food and women. Each has its own unique taste, smell and overall experience. Some are memorable like this simple chicken sandwich in a baguette I ate in Paris, while the same thing I ate in Des Moines, Iowa was as forgettable as that Matt LeBlanc show after Friends. The same can be said about certain late night rendezvous where I’ll never forget the first girl to show up at my house with strawberries and cream, but am trying to forget about the one who brought BBQ sauce and coleslaw. 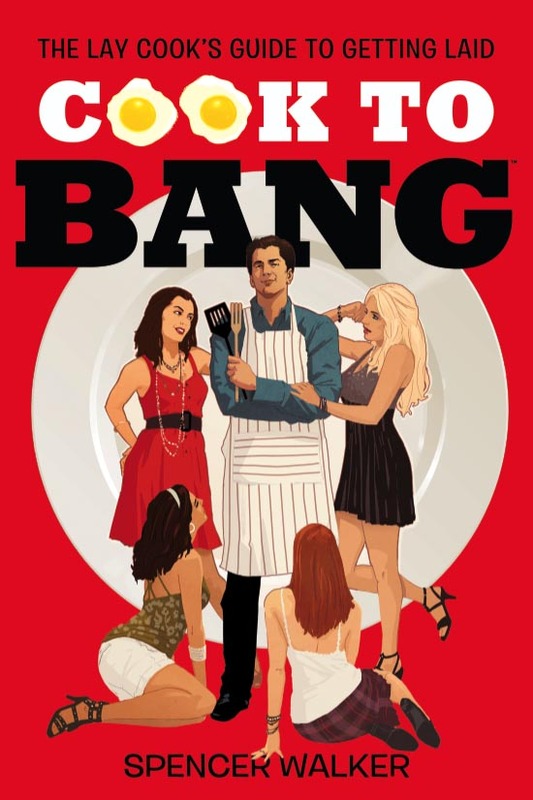 This research is done in the name of Cooking and Banging. I do not take it lightly! But one particularly memorable CTB story took place in Costa Rica. I met a senorita that laughed at me from the beach as I attempted to surf. My Spanglish worked well enough to charm her into inviting me over for a post-surf lunch. 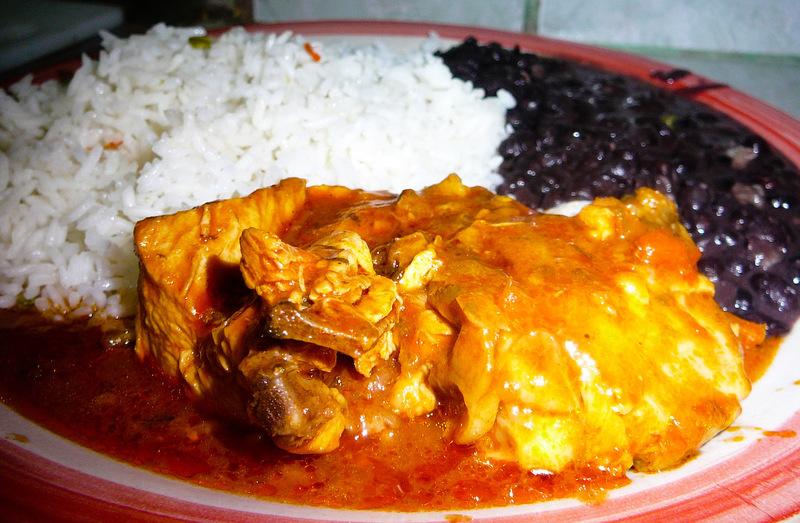 This chica’s abuela was making this chicken dish in her tiny kitchen. I ignored her granddaughter and assister her in making this dish. The ploy to choose the chica’s grandmother’s company over hers became a double checkmate. Not only did I learn and document an awesome new recipe, but the semi-jealous chica also made sure that I was completely satisfied after lunch in the hammock. Melt the butter in a large pot on medium-high heat. Throw in the bell pepper, onion, garlic and cilantro and cook until they soften (approx 4 minutes). Add the achiote paste and cook until the veggies go red (approx 2 minutes). Throw in the chicken and cook with the veggies until the skin browns on each side (approx 5 minutes). 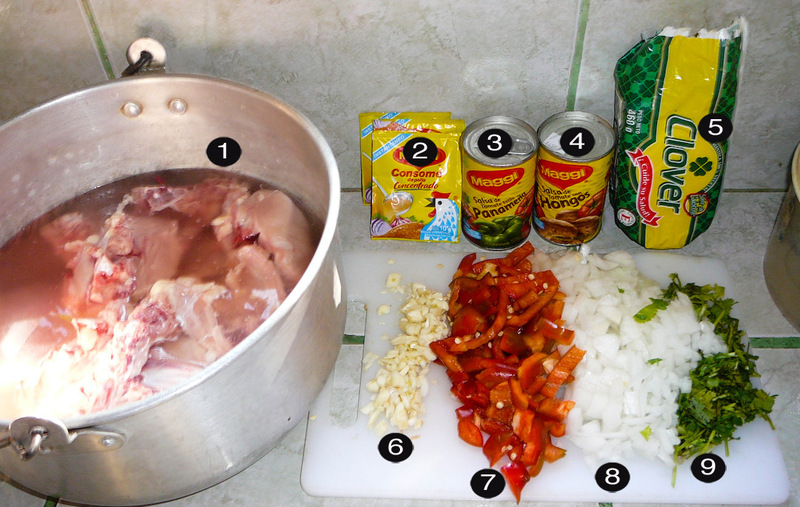 Add the consome/bouillon packets and a cereal bowl full of water. Dump in the salsa cans of mushrooms and green peppers if you so desire and bring it to a roaring boil. Once you have the mixture boiling, turn down to low heat and simmer with the pot covered until the chicken softens and cooks thoroughly (approx 50 minutes). 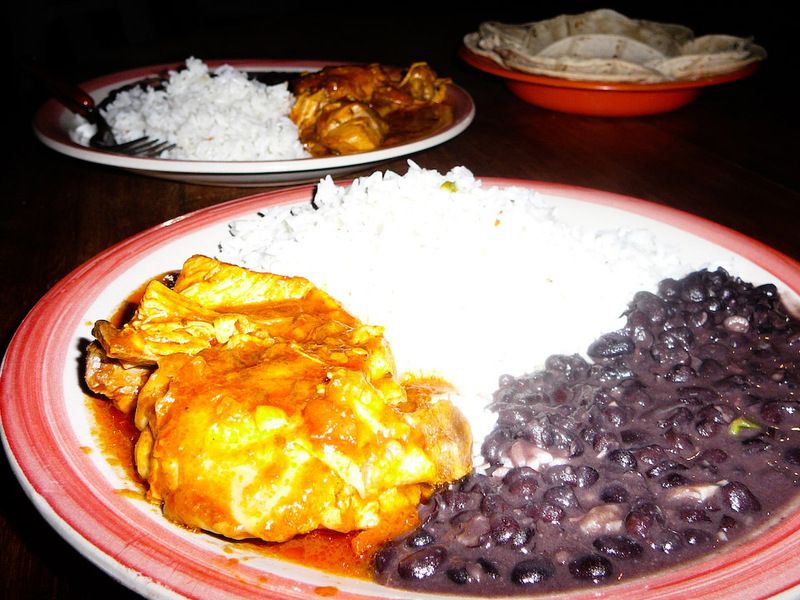 Serve it up with some RICE, black beans and tortillas. I’m impressed with your tenacity! Alot of the time i see pages with silly comments and thought wouldn’t it be nice to be one.. Nice blog found you via google. Will check back. See what other jems you post. Hi I am so delighted I found your blog, I really got you by mistake, while I was searching on Google for something else, Anyways I am here now and would just like to say thanks for a tremendous post and a all round entertaining blog (I also love the theme/design), I donâ€™t have time to read it all at the moment but I have bookmarked it and also added your RSS feeds, so when I have time I will be back to read more, Please do keep up the great work. I spent two weeks in Costa Rica and when I got back I missed the food so Much! This recipe is the closest thing I found to the chicken, and I must say I love it!! Wow! Looks Awesome! Trying this tonight and I’m Costa rican just got back last week from a family reunion. Will be checking out more of your blog. (Your funny) . Love my culture and food. Hope to go back to retire there.